TG stories including transformations and body swaps by erotica author Ben Schrodinger. Schrodinger has been specialising in TG fiction since 2012 and writes strong, plot driven gender swap stories with slow and detailed gender transformations. 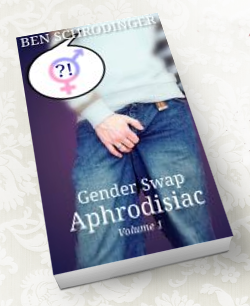 For a limited time we are giving away his first book Gender Swap Aphrodisiac 1 free when you sign up to the mailing list (normally $2.99).